Development: Story selection and rights acquired; idea being crafted into usable script; financing and casting attachments sought; aiming for 'greenlight'. Sony Pictures is in negotiations to hire screenwriter Becky Johnston to work on the script. The continued adventures of double-agent Evelyn Salt. 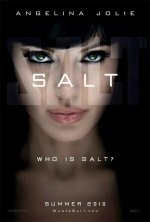 Kurt Wimmer, the writer on Salt, has not written a script, but "has ideas for how to advance the story of the spy thriller" according to L.A. Times. Sony will or will not greenlight the sequel based on the worldwide box office success of Salt. A follow-up to the 2010 spy movie, which grossed $293.5 million worldwide.